A seasoned traveller who regularly stays with us, recently told us that one of the things he loves most about Ireland is the perspective it gives you on life. Just experience the ancient ruins, the centuries-old wild beauty and the vast Atlantic Ocean that stretches out before you, and it’s impossible not to feel humbled. We’re just specks in the universe, he said. Perhaps nowhere gives you this incredible experience quite like the place that’s very close both to our door, and to our hearts: the mighty Cliffs of Moher, jewel of the Wild Atlantic Way. 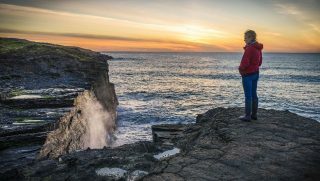 Doolin Inn is perfectly placed to be your base while you discover these mighty and majestic cliffs, which are one of the Wild Atlantic Way’s Signature Discovery Points. They are one of Ireland’s top tourist attractions, and visit once and you’ll know immediately why – they truly are Ireland at its most rugged, panoramic and awesome. The Cliffs stretch for 8km (5 miles) and reach 214m (702 feet) in height at their highest point – providing views of the Aran Islands, Galway Bay, the Twelve Pins and the Maum Turk mountains in Connemara as well as the Dingle Peninsula and Blasket Islands in Kerry. The rocks that make up the Cliffs of Moher were formed over 300 million years ago, during the Upper Carboniferous period. But they are so much more than a geological phenomenon: the Cliffs are also an important area of conservation, an area of immense natural beauty and diversity – and just a wonderful place to walk and experience wild Ireland in its purest form. To find out everything you need to know about the Cliffs – there’s the award-winning The Cliffs of Moher Visitor Experience, located almost midway along the Cliffs. This is a world-class, environmentally friendly visitor centre set into the hillside, featuring an interpretive centre that explores the themes of Ocean, Rock, Nature and Man. After you’ve explored the many interactive displays, enjoy a coffee or lunch at the coffee shop – and there are lots of wonderful gift shops in which to find souvenirs and special treasures. Sunset is the ideal time to visit the Cliffs of Moher, when they are lit by the sun and there is ideal light for viewing. Weather obviously impacts on visibility – so you’ll need to be flexible. If birding is a passion – you’re in for a treat too. The Cliffs are a Special Protected Area due to the large number of bird species that make their home here – including chough, fulmar, kittiwake, Guillemot razorbill and puffin. Over 30 000 pairs of seabirds choose the Cliffs as a breeding ground, and from April to July, during the nesting season, it is possible to view over 20 species of birds in the area. One of the favourite ways our guests choose to experience the Cliffs is the beautiful Coastal Walk. Our Inn is located at the start of this 20 km trail and is accessible right from our doorstep, so it couldn’t be more convenient. The trail stretches all the way to Liscannor, 20 km away, and 12 km to Hags Head. To walk from Doolin to the Cliffs of Moher visitor centre will take approximately 2.5 hours (8 km) – and will give you amazing views of the Cliffs, the Aran Islands, Kerry mountains, Galway Bay, O’Briens Tower and of course the abundant flora and fauna of the area. Just be sure to come prepared with sensible walking shoes or hiking boots, water and a rain jacket – and remember, it is not advisable to walk in windy or poor weather conditions. If you’d rather see the Cliffs from down below, why not opt for a fabulous mini-cruise on one of the ferries that leave regularly from Doolin Pier. Your guide will share lots of information about the Cliffs and point out various points of interest as you go – from O’Brien’s Tower to the many sea caves and sea stacks. The Cliffs of Moher offer so many experiences in one – and definitely need to be on top of your to-do list. Let us help you plan a trip of a lifetime!